Review: About a young couple who learn important values from an elderly man who they rescued from a car accident. This is no The Notebook or The Lucky One but it is still worth the watch because it is adapted from a book by Nicholas Sparks. You always know where you stand with a Nicholas Sparks film. This is the 10th book of his to be made into a film. In this film it involves the usual, letters, a lake and the main guy taking his shirt off. 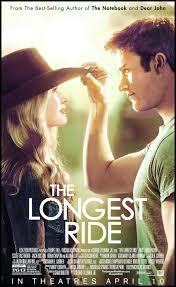 Scott Eastwood is in this who is the son of Clint Eastwood. North Carolina looked lovely and has made me want to go there. Love the scenery. As we watch this film there are important key figures in this and the first one is the mechanical bull, this symbolizes Luke’s Father, The Ranch symbolizes Luke’s Mother and her childhood, The Deli symbolizes and represents Sophia’s past and her family, The Art Collection represents Ira and Ruth reconnecting in their marriage, Portrait of Ruth symbolizes Ruth and all her great qualities and the last one is The Cabin this symbolizes Luke and Sophia’s rekindling. According to the BBFC during post-production, the distributor sought and was given advice on how to secure the desired classification. Following this advice, certain changes were made prior to submission.